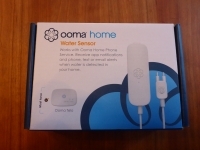 The Ooma home Water Sensor also comes in a full color box. The front cover indicates you need to have the Ooma Telo and mentions app, text and email alerts. The flip side of the box has the same information but in French. Flipping the lid of the box you'll find the sensor neatly tucked in the formed cardboard tray. Under the sensor you'll find (2) AAA batteries and various double stick pads and screws with wall anchors for mounting. 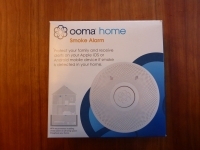 Next up is the Ooma home Siren. This packaging is a bit different and is a full color sleeve over the contents. On the front it shows a picture of the product and clearly mentions you need the Telo Hub for it to operate. It also mentions the siren is rated at 105dB. The side mentions some of the configuration you can apply within the hub, type of plug it requires and mentions the 1 year warranty. Removing the tray from the sleeve you'll find the siren. While this plastic tray feels and looks fairly cheap it does hold the siren quite securely. 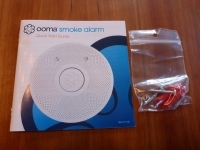 The Ooma home Smoke Detector is shipped in a thin cardboard box which has a picture of the device on the cover and mentions getting alerts on your mobile device if smoke is detected. The side panel discusses some other features like the 10 year non-replaceable battery, photoelectric smoke detection, button for testing and to hush false alarms. It also details the contents which as you would expect include the sensor, a mounting bracket and screws with wall anchors for mounting. Also included are requirements/limitations and info on the warranty. Inside you will find the detector shipped only in a bag to protect it from dust with the quick start guide and hardware loose in the box. 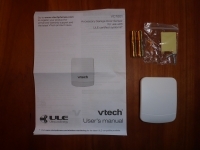 Finally we have the vetch Garage Door Sensor. This package is slightly different, it is a heavier cardboard box with a hang tag. The front has a picture of the device and details some features like ease of installation, 2 year battery life, no monthly fees and programmable alerts. 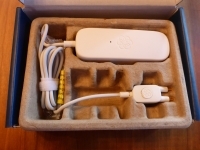 The sides of the box review features, contents, ease of installation and programmable alerts. Inside the box you'll find the sensor inside a crudely formed but functional case. The sensor itself is bagged and the (2) AAA batteries, screws and double stick pads are also tucked inside. Overall Ooma home does a good job of conveying what the product is and the features it has. They also covered the bases by providing batteries for all devices and several options for mounting. 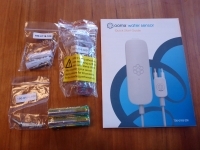 While not included with these individual devices Ooma did supply a roll of sticky Velcro tape. I would recommend this is or something like it to anyone setting up a system like this. I often find the double stick pads supplied are a bit rough on your walls or trim if you try to move things. And quite honestly things like motion sensors often take a bit of time to find the right spot, especially if you have pets.